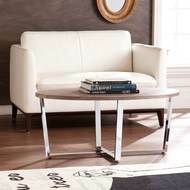 We are often asked what the proper distance should be between your coffee table and your sofa. On average, there should be about 18 inches between your sofa and the cocktail table. This allows a reasonable space to walk between them, and also a comfortable reaching distance for picking up or placing items on the table. For more great ideas visit www.cheapchicdecor.com.